Contrary to what most public restrooms show, we like to believe that every person out there at least knows how to flush a toilet. But what do you do when your water is turned off for plumbing work? This isn’t as common knowledge to the average person, which is why in this blog post, we’ll go over how to flush the toilets in your home or office while you’re having plumbing work done or when your water isn’t working. 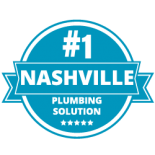 At Plumbing Solutions, we provide affordable plumbing services to Nashville and surrounding communities. 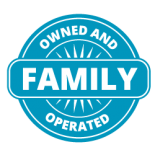 We are the area’s #1 plumbing solution, and our family-owned-and-operated business offers 100 percent customer satisfaction guaranteed. 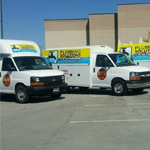 Looking for a reliable plumber you can trust with your plumbing system? Give us a call today! About 99 percent of the time, our toilet flushes as it should and the plumbing systems in our building work perfectly fine. For that frustrating 1 percent, it’s important to know what to do in an unexpected plumbing situation. When your toilet doesn’t flush properly, this is usually considered a plumbing emergency. However, there are cases where you water must be turned off, creating an embarrassing situation for whatever person accidentally uses your toilet while your water is off. Fortunately, even when there is no running water in your home or office, there is still a way to eliminate the toilet’s … um… “contents”. Your toilet tank actually fills up right after you flush it, and it remains this way until the toilet is flushed again. So, if you’re lucky, this means you have one flush to use even after your water is turned off. Use this one flush wisely. If by chance you are out of flushing luck, not all hope is lost. Want to know a secret? Your bathroom toilet’s plumbing doesn’t actually need pressure or running water to function properly. Surprise! You just need access to water to fill your tank, but from there, you can thank gravity for the flushing process. If there’s no remaining water in the tank of your toilet, it’s easy to replicate this action. All you have to do is manually dump water into your bowl, and your toilet should flush as normal. 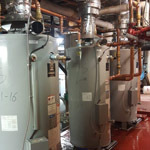 Of course, if you don’t feel comfortable with DIY hacks and your plumbing system, always resort to calling for the help of a professional plumber. 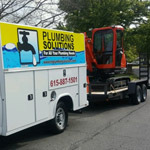 If the water in your home or office randomly stops working or if you simply need to have routine plumbing work done, feel free to reach out to our team in Nashville at Plumbing Solutions. 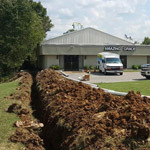 We provide affordable plumbing services to ensure you have functional plumbing when you need it most. 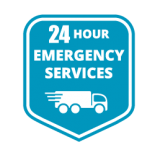 Our team is also available 24/7 for your plumbing emergencies. Not sure if you’re in an emergency or not? Check out this blog post for more information. Get started today and choose an affordable plumbing team you can count on! You can reach us by calling (615) 823-7223 or by filling out our online form.